At a recent show, Keith Cooper noticed PermaJet’s new ‘Titanium Lustre’ paper, with its ‘metallic’ finish. 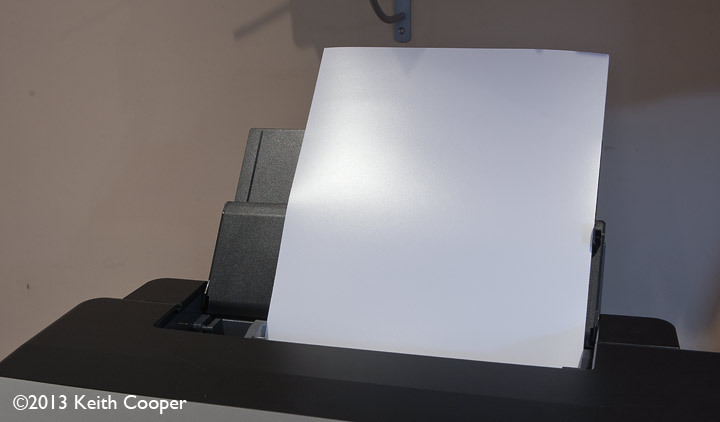 He has been testing this paper on an Epson R2000 and our 44″ width Canon iPF8300 printer for both colour and monochrome printing. The cut sheets are available now (Apr. 13) whilst rolls will be available from May, with worldwide availability from June 2013. The paper looks like a normal lustre coated paper, until you take a more careful look at the surface sheen. It feels slightly thin (0.28mm) for a heavy paper and would benefit from a white backing when framed (as would many thinner papers), but what sets this paper apart is the way it and applied inks reflect light. It’s taken quite a bit of effort to try and show the effect here – it’s quite subtle, but distinctive. Do realise though, that this is not like printing on to a sheet of aluminium, or any of the other specialised metal printing available (at not inconsiderable cost it should be noted). It also takes some care as to what images really benefit the most from this paper, it doesn’t necessarily suit soft landscapes or portraits. The black and white print of the Leicester guild hall at night worked well, but it is an HDR based image, taken just after rain. 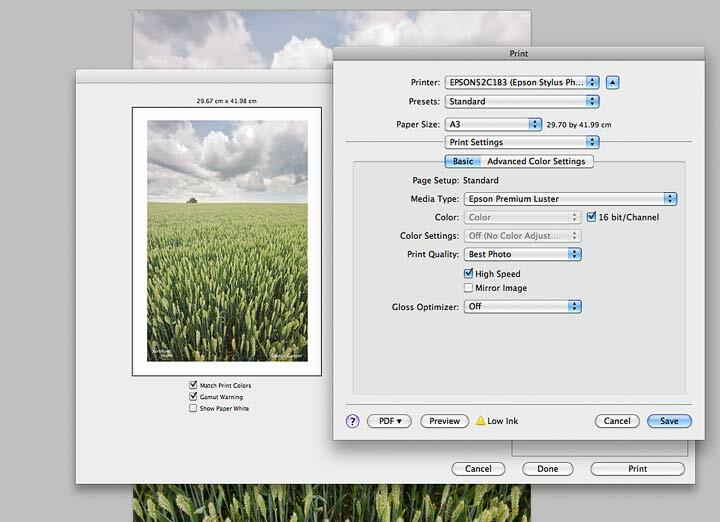 Paper details can be downloaded from PermaJet, who also offer media settings advice and a free custom profiling service for all of their papers. Coatings – Single-sided, metallic resin coated lustre base. 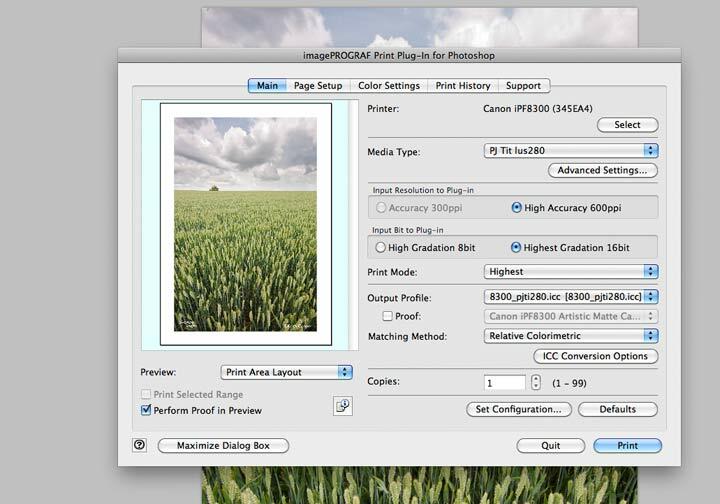 Primary Features – High Dmax, Excellent tonal range, High colour gamut. There is a range of sizes available. For all our paper tests I create our own profiles, printing out a sheet of coloured patches (~2700 on an A3 sheet) and then measure them with our iSis scanning spectrophotometer, before creating profiles. For our Canon iPF8300 I also created a custom media type – based on the Premium Semi-Glossy Paper 280 setting – this worked well, giving a good ink coverage and wide range of colours. 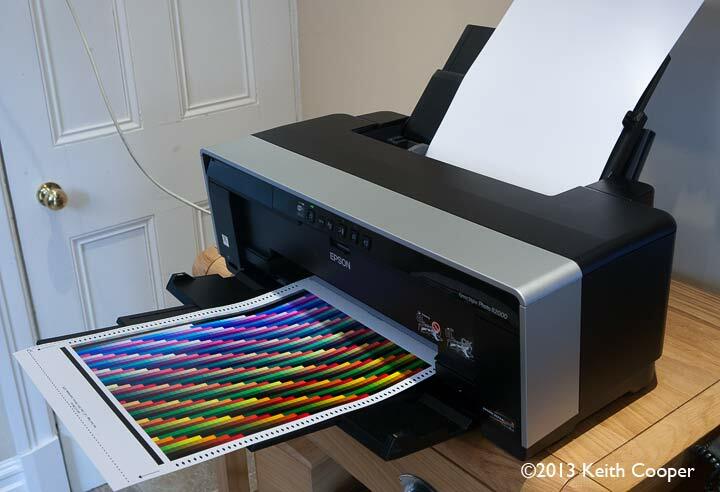 For black and white printing, I used my colour profile for the R2000, or the B&W print mode of the iPF8300. One thing to consider when using the R2000, was whether to apply the gloss overcoating. Here are two versions of the profiling target, one (top sheet) with the GOP (gloss optimiser) and one without. Given the importance of the surface sheen of the paper, I felt that the non-GOP version gave a better looking metallic finish. 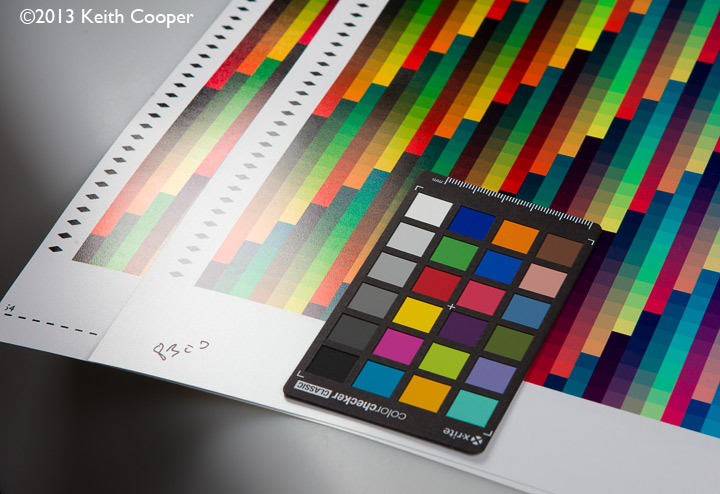 The iPF8300 (12 inks) showed a slightly larger colour gamut against the R2000, but not enough that the R2000 wouldn’t produce very good prints of most subjects. The paper does have a slightly ‘greyer’ finish than a normal high brightness paper, and measurements of the spectral response show the presence of a modest amount of optical brightener. For printing with he 8300 I defined a custom media type. Whilst on the R2000 I used the ‘Epson premium luster’ setting. The paper had no problems with curl, and fed through the R2000 cleanly (5 sheets stacked in paper tray below). The surface finish for the paper is fairly robust, but will mark if roughly handled. This picture of a ripening wheat field gives a bit of the feel for how a print looks – move your mouse over the image to see a magnified view. Very much a paper that will influence the look and feel of your prints – they all do, but this one is more likely to divide opinion. It’s certainly a paper to give a distinctive extra ‘punch’ to your images. As I mentioned, it’s not going to suit all styles of image, but it’s nice to have a paper that pushes the boundaries a bit further. If you’re a fan of high contrast images, then this is a great option to explore. It’s not easy to show here, but with the right images, it really is quite different. 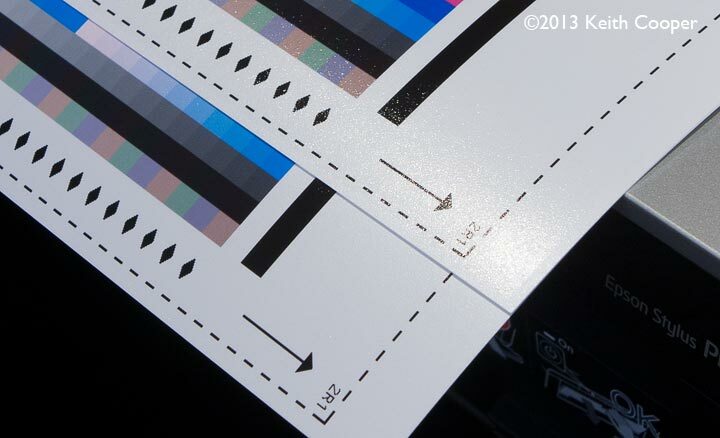 The paper showed very little gloss differential with the pigment inks of the R2000 or iPF8300 and profiled well. It’s rated for dye based inks as well, although we didn’t have any such printers to test it with. Monochrome prints work well, with good depth in the shadows. Think carefully how you are going to display any prints, since lighting makes a big difference to the amount of metallic ‘feel’ to the print. It’s very good for some of my commercial/industrial photography, where the only time images tend to get printed, is for samples I give out. A 280gsm Lustre finish paper, with a distinctive metallic sheen. 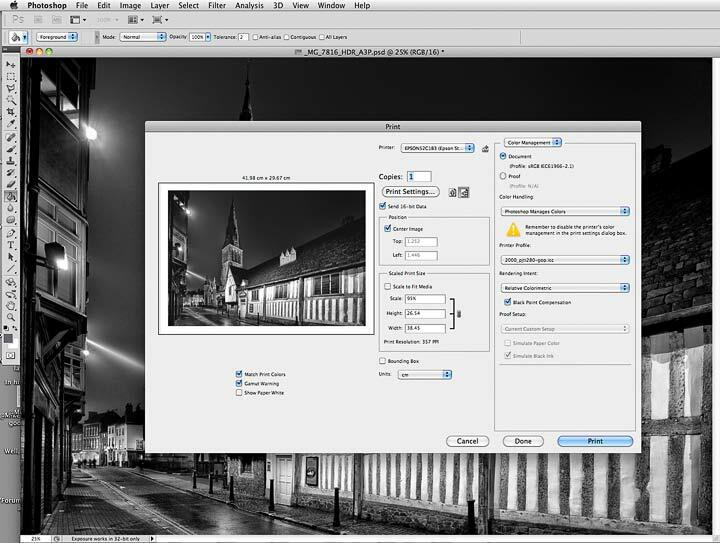 Offers the chance to create some distinctive prints of higher contrast images. Supplied through PermaJet, who also offer media settings advice and a free custom profiling service for all of their papers.